SUMMARY: Anna and Abel could not be more different. Anna's life is perfect, easy, safe, clean. Her parents love her and provide for her as every parent should. Abel and his six-year old sister barely scrape by. Desperate to stay with his sister since their mother disappeared, Abel struggles to stay awake at school by day and earns money by dealing drugs at night. When a chance encounter brings Anna and Abel together, Anna sees beyond Abel's drug-dealing, closed-off, tough guy exterior. Curious, Anna follows Abel and eavesdrops as Abel tells his sister an epic fairytale. The story is about a tiny queen who is in danger, and it parallels Abel's and Micha's struggle to survive and stay together. Entranced, Anna cannot pull herself away and is eventually invited to join Abel and his sister for the story. But as characters in the story are lost, so too do Abel's enemies start turning up dead. Abel seems to know things before they happen, and Anna begins to wonder how much Abel is keeping from her. Could he be involved in the murders? REVIEW: Have you ever finished a book, closed the front cover, and just sat there staring at it blankly? 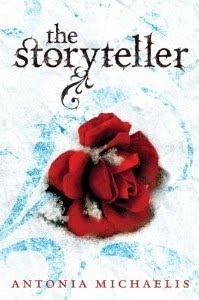 The Storyteller is such a book. The writing is among the best I've seen; the story, unique and quiet and darkly beautiful. It is both surprising and heartbreaking. I didn't really expect the romance to be so central to the story, but it was. That first kiss scene was so sweet that I reread it three times. Michaelis's writing style hooked me right from the beginning. The story is well-paced, and I had a difficult time putting it down. I can't say enough about the BEAUTIFUL writing style. It's not overly-flowery; it's just absolutely gorgeous. As much as I could see The Storyteller as a movie, I doubt I would go see it. I can't imagine what director could make a film rich enough to capture the intense emotion and exquisitely dark beauty contained between the book's covers. That's all I am going to say in this review. I know I should say more and the review feels a bit incomplete, but I fear that anything I write in this review could spoil the ending and what the "real" story is. I would like to caution readers to try not to look too hard for the answers. They are all there, and some readers will no doubt piece the story together early on. Just go with it; it would be a shame to figure out the little queen's future before it is time. THE BOTTOM LINE: Beautiful, dark, heartbreaking. Highly recommended. Keep the Kleenex handy. STATUS IN MY LIBRARY: No way I can get it. Mature content.